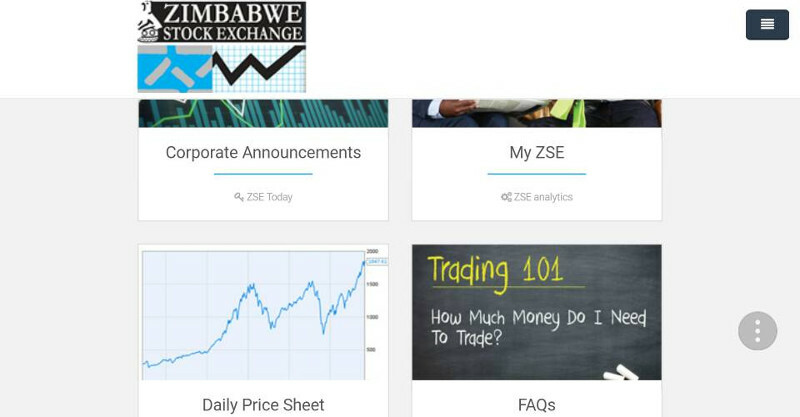 The Zimbabwe Stock Exchange (ZSE) has refreshed its website. They have gone for a more modern design which is easier to navigate. The information provided once one clicks on those tabs is more or less the same as it was before. It is just easier to get to, especially the analytics information. Clicking on the Daily Price Sheet tab however, one is advised that they will have to pay for that information. This information was free before. Looking from the outside in, this doesn’t seem like a viable revenue source for the ZSE. It has been a running joke just how ineffectual the official ZSE website is and so it is hardly used. From the outside looking in, it looks like the ZSE is scrounging for scraps here. In recent years as Zimbabweans have warmed up to capital markets the number of people looking for that information must have increased though. When one also considers the events that transpired in November 2017 in this country and how foreigners have been active on the ZSE, such information must be in higher demand than before. Right now the ZSE is not performing too well. Since the turn of the year, market capitalization has fallen to around $8.6 billion from just under $10 billion. However, analysts expect that there will be increased activity after the elections as most investors have adopted a wait and see attitude. As investors, both domestic and foreign, wait to see which direction the nation takes they however are monitoring the ZSE. The ZSE realized they have a monopoly on certain information on the listed counters and as such would make sure they got something for that information. So it may seem like they are scrounging for scraps but it kind of is a smart decision. What it is not smart however is the rush in refreshing the ZSE website. A lot of tabs are broken, some information is missing (a good portion of market commentary is nowhere to be found for example), the pages are misaligned and the scrolling is janky. Some text is supersized and some graphs have no labels, which defeats the purpose of the graphs. A lot more is wrong on this website, lack of API integration support being a big one. This feature allows third-party websites to extract and analyse data. This might be by design though and not oversight. That information has to be subscribed for now. Maybe such third-party websites will be required to subscribe for that priviledge in the future. One assumes work on the site is ongoing but it never should have been released to the public in its current state. What is frustrating is that this is not the first time the ZSE has gotten it wrong when it comes to its website. Back in 2011 the ZSE website was hacked and it stayed down for about two years. The experts we talked to say this was down to the ZSE’s choice of website vendor. After that hacking, the ZSE engaged Big Law as website and data vendor and we all applauded the move. That deal technically involved the ZSE’s content being displayed on Big Law’s website. That union did not last too long though. After firing Big Data, the ZSE went on to invite website vendor applications in 2016. A new website was launched which to be frank was inferior to the Big Law one. It is that website which has been refreshed/replaced/upgraded. It is not clear if it is the same website vendor responsible for both. In late December 2017 the ZSE website was hacked again except that time it was their host which was hacked. It was after that hacking that we noticed some market commentary information missing. One could also wonder if the choice of website host needs to be revised too. I think the ZSE is placing too much weight on the strength it has emanating from having a monopoly on some information on listed companies. They are not too worried about the experience for visitors to their site as evidenced by their website vendor decisions. They figure you will come anyway as they are the sole source of that information. It is quite a dangerous position they have taken. Thanks Finmania for showing the oversight on our part. We have included one screenshot as an example of what we are talking about, take a look at the article again. Try it yourself, navigate to Market Data>Market Commentary and see if you find anything for 18 January 2018 and earlier. The issue of misaligned pages and graphs missing however is only visible when a user zooms in to the website. The website in its current state does not cater to those who need to zoom in to see clearly. Try it yourself, zoom in to 125x or more and you will see what I’m talking about. We would not lie about something like this. We cannot be fake news. Take a look at the following sites http://www.stockexchangeofmauritius.com/ , http://www.jpx.co.jp/english/, https://www.jse.co.za/, https://www.nasdaq.com/, http://www.londonstockexchange.com/home/homepage.htm, http://en.boerse-frankfurt.de/ and many others. I would congratulate ZSE for the security features they have added, I see they have encripted their website, giving us confidence. I see tested by lets Encript, same as TechZim. Lets hope its as good as they say it is. I would congratulate them for adding the plots, its good to see Zimbabwean company perfomance, can you please add the volumes and so much more. Its good you gave us the listed companies but we would liketo know who sits on those company boards, we would like to know for how long and what they have been involved in. Information disclosure is needed, you are the only place where such can be found. Iliked the last updated on your tables, it instills confidence, I see its green, what happens when you dont update the data on time. realised the index table doesnt have that feature, can it be added. As for the ticker, tables and plots, are they real time, can they pick changes during trading hours? When I visited your single stock viewer, realised I landed on an ALLSHARES plot, what is that. I also realised by selecting the stocks I am getting their price time series, where are the volumes, its awesome you have interactive plots. I like it, puts you in the same league as Bloomberg ( https://www.bloomberg.com/markets/stocks ) and Thomson Reuters ( https://www.reuters.com/finance/stocks/chart/ECO.ZI ), something unique, good for marketing and a show of the market and individually listed individuals. If you could also consider Relative strength and other features, that would help us. Below those plots there is lot in analytics you could put. Same goes for the multi selct one, I see I landed on the indices then selected. I see the table grows with the selections I make, awesome. But the page is too blank, add some content please, even news feed from the various press organisations concerning those companies being viewed. Please do consider putting more, visit other financial sites for more. 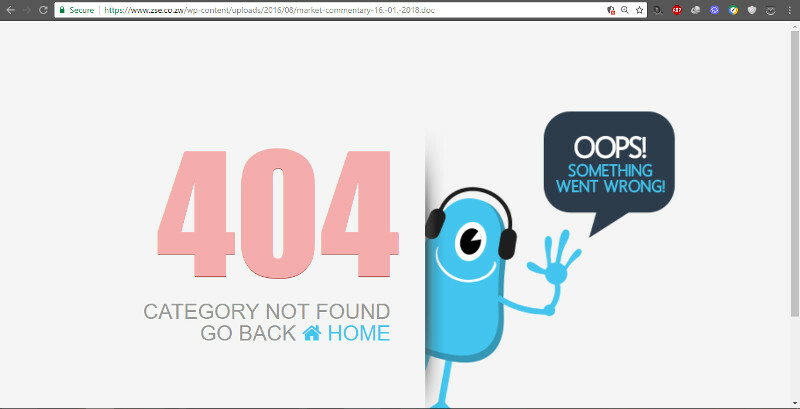 I see you took the blocks from CNBC ( https://www.cnbc.com/world/?region=world ), your development team seemed keen to show they can also do it, and the tables again, wow ( https://www.cnbc.com/markets/ ). If there is room for them to do more tell them to do much more. I think this will add value to the market as a whole and our press can get better images to publish. Also, I wanted to inquire, where are the currency tables, suppose I have rands, pounds etc, how do I know how much each share is worth in my currency. On finance 101, can you add more there to educate the Zimbabwean public to avoid hpyramid and trading schemes they are losing mioney on. It would be wonderful if one of your brokerage firms ran a online learning platform there. That would be focused more on Zimbabwe. That would actually help locals and internationals in making sound investment decisions. The rules and regulations part is awesome, add more for the general public not just the firms that want to list. I believe you have the potential to do more there. Especially with President ED’s 100 days strategy, I think you need to turn your focus on marketing yourself locally. make people know you are there and if they want to invest money they can do so. I see you have your borker list there, nice move also. Removes bogus entities from the list. Makes sense having those guys listed there. Hope they have other packages lined up. As of yesterday there was no Notices tag, today I see a notice tag, good move, making your events easier to access. I see that under FAQs you have an openning and closing time, thats great, but can you move it to the front. making the public know what time your trading sessions are opening, though I feel its a short trading session. make it longer please. Unfortunately am not the article writter here but am just aknowledging what I am seeing. Great job, I hope this is not the end, that website needs to be developed more. Manage your content and space, dont be pressured to add more if its not ready but for ED’s 100 days guys you just killed it. Ohhh, I did the unthinkable, didnt thank Leonard Sengere and the TechZim team for noticing that those dudes across town changed their website. In as much as I am a critic of their reporting but got to aknowledge they are always up to date. Great many thanks guys but do change the approach please. In as much as there are errors and all, its worth to balance the two, sometimes letting the owners of the technology being criticised know of the short comings before going public would help with mantaining the integrity of Zim as a country and the investment environment that is there. It would also help to mantain the integrity of Zim developers themselves. If we let the foreigners know that our developers made these mistakes at the end some firms will out source developers. Which is bad, we wont develop the skill set locally. I am not a developer but am just a finance enthusiast and trader. Am concerned with how we view our own, and how we comment will actually impact the view foreign investors have of this nation.